As noted below, Birinyi Associates was recently cited in the news about a study done on the SEC's repealing of the uptick rule and its possible impact on the market. For those not familiar, the "uptick rule" required that a short seller offered their stock above the previous trade, so as not to cause declines in price as a result of shorting. The rule was repealed after the close of trading on July 6, 2007. Since that was a Friday, we first begin to see the impact on Monday, July 9th. The three charts presented below illustrate different measures of market activity that have changed since that rule was repealed. We grant that the subprime mortgage market has become more of an issue since then, and its legitimate impact on corporate earnings cannot be denied, but we must ask whether market volatility has been aggravated by regulatory changes. 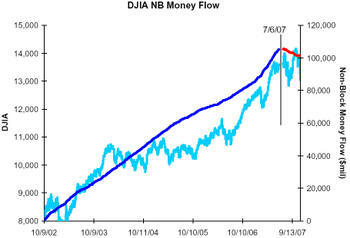 The DJIA money flows had been strongly positive throughout this cycle, until the regulatory change. 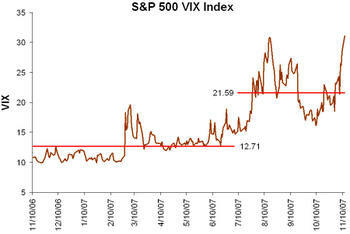 We also notice increases in volatility based on the two measures shown below. At 3:40pm on November 15, 2007 the market is down 1.8%. By nature stocks decline in price more rapidly than they gain, but how much has shorting impacted the total decline on the day? 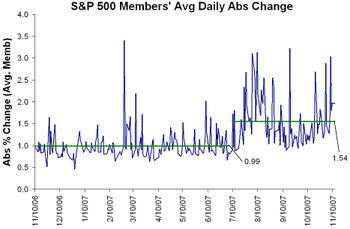 I am a long time member of the futures exchanges and have always hated the uptick rule. I believe it is too early to tell how big a factor changing it has been. But I have noticed something I would like your opinion on. i believe the explosion of ETFs and arbitrage associated with them has lead to increased correlation between individual securities. I believe this shows up primarily on volatile days. Being bound to work restricts freedom. Don’t you sometimes feel like running away from the hassles of work? Does marriage also restrict freedom? I think many married people feel that their freedom has been restricted. Is it not possible to not to be bound to anyone or anything and live life on day to day basis and do whatever, whenever and wherever you feel like doing (here I am not talking about insane things). Do you feel sometimes trapped by modern forms of slavery like mortgage etc? Think of how they all adore you! If you want to find a reason to not do something then that's no problem. More than half of all children aged 3-8 said story time was their favourite pastime with their parents. Wife talking to her husband(who reads newspaper all day): I wish I were a newspaper so I'll be in your hands all day. If you can add in your article some of your personal opinion , I think your article will be more exciting and interesting . However, your article contains a lot of valuable information and knowledge , and expect you to bring us more fun and surprises .